During the second quarter earnings call with analysts Wednesday, Boeing Co. CEO Jim McNerney said the recently announced plan to automate assembly of the 777 fuselage is just the start. “I think it’s safe to say that over time we would anticipate expanding that capability,” he said in response to a question about other aircraft models. McNerney said the automation drive is intended to accomplish three things: increasing the quality of aircraft, cutting costs, and improving worker safety. As an example of the latter, he said he recently visited Boeing’s Everett manufacturing plant, where he saw Boeing’s automated 777 wing paint facility at work. “A terrific job is being done to use automaton to paint major structures,” he said. The new robotic painting machines are responsible for washing, applying solvents to, rinsing and spraying two types of paint to 106-foot 777 wings, and are capable of reaching into some of the more complex spaces within the wing for corrosive protection. The robots glide along tracks set to either side of the wing, and are able to crane their animatronic necks to provide a perfect paint coat. Painting the wings manually would take a team of painters 4.5 hours, but the robots are able to get the job done in just 24 minutes. To the critics that say, robots are replacing jobs, according to Jason Clark, Boeing’s director of 777 manufacturing, was quick to point out that “no layoffs occurred because of the implementation of this technology.” To compensate for the machine takeover, half of the 777 wing-painting team have been reassigned to related jobs, such as programming the robots, or painting more complex parts of the plane that can’t be handled by a robot, such as painting the airline liveries, or handling the aerodynamic finish required for the 787-9 tails. Elizabeth Lund, head of the 777 program, said that the previous, manual painting method had been a solid barrier to increasing production rates. But thanks to Boeing’s lean-manufacturing-inspired switch to robotic painters, the company has been able to increase its output to 100 jets per year—which comes out to 32 wings more than was previously possible. “When lean works properly, and this is a perfect example, you increase capacity and you don’t lay people off,” Lund said. The inspiration for Boeing came on a trip last year to the BMW factory in Munich, which is run by hundreds of automated systems with the help of just a few workers. But while 95 percent automation is becoming a new norm for the auto industry, Clark notes that Boeing is 90 percent manual, and that an aircraft factory will likely never meet that rate of automation. 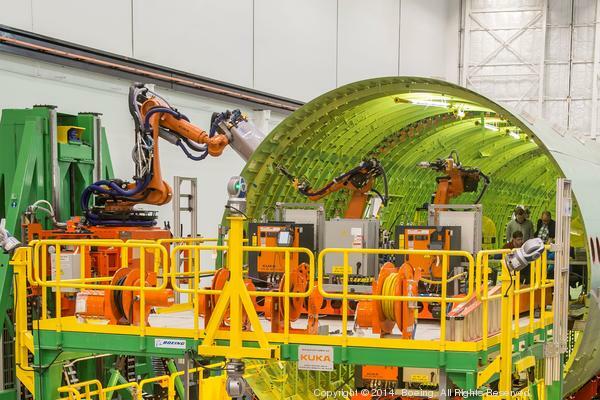 According to McNerney, Boeing is expanding its use of automation to build the 737 wing. The company will first start automating the drilling and riveting on the current 777 fuselage, and then expand that to the initial 777X line. By following the Boeing example one can see that humans are now empowered to use their brains instead of repetitive tasks to insure that costs, quality and safety are all in line. Its about time.